Bottom Line: I feel like it’s important to note that I’m not a Star Wars fanatic. The series has always been overrated to me and while the original trilogy is definitely classic in the sense that they were groundbreaking films at the time and have had a tremendous affect on pop culture over the last 40 years, the movies themselves are merely enjoyable to me. I’m not wrapped up in all the mythology and I don’t watch all the movies again when a new one comes out. I haven’t seen a film in the prequel trilogy since Revenge of the Sith was in theaters. I did really enjoy The Force Awakens though and for the first time in my life I felt some of that Star Wars magic that everyone else is so enamored by. The Last Jedi felt nothing like that. Right from the jump, we are hit with cringe-worthy dialogue and humor that doesn’t land. I chuckled one time during this movie and I was supposed to laugh a lot more than that. And then we are introduced to a Luke Skywalker that is nothing like your childhood hero. Even Mark Hammill hates this version. 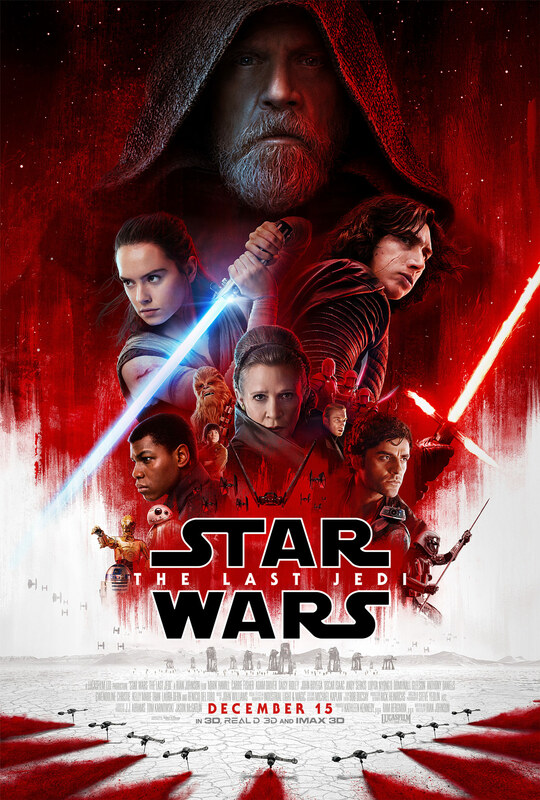 I can’t get into all the minutiae of why this film is a poor follow up to The Force Awakens – I’ve seen fans nitpick all the relevant little details – but what I can say with confidence is that I was pretty bored while watching it and it was incredibly long for a movie that wasn’t highly entertaining. John Boyega’s Finn – one of the highlights of the previous film – has a much less interesting role this time around and goes on a side adventure that borders on prequel levels of terrible. I wasn’t a fan of Adam Driver’s Kylo Ren in the last film and this movie doesn’t help with that. Can you imagine Star Wars without Darth Vader? He’s a huge reason why those movies are memorable. Just a great villain. Kylo Ren is more similar to Hayden Christensen’s Anakin Skywalker than to Lord Vader – and that’s not a good thing. Plus, he spends this entire movie with his mask off. Ugh. The Last Jedi does have some cool moments, but I think they occur far less often than dull or laughable ones. The critics enjoyed this movie, but I personally can’t recommend it. I can’t even say Star Wars diehards will love it because it seems as though the fan base is pretty split, but there are enough people that hate it, that I feel it’s fair to warn people to temper their expectations. Replay Value: I don’t have much interest in seeing this again. My friend that went with me was happy to see it a second time though. Sequel Potential: Episode IX is due out in 2019. Oscar Potential: Star Wars movies are always strong candidates of Visual and Sound nominations. This movie will not be a contender for Best Picture.